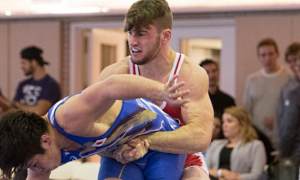 Before today, the last time Mason Manville (77 kg, Army/WCAP) returned from a hiatus he had won World Team Trials challenge tournament and looked more imposing than ever doing so. This time around the script is playing out in similar fashion, and it’s delivering a marquee match-up most likely didn’t expect to come this soon. 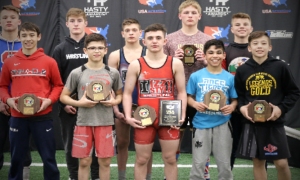 Day 2 of the 2019 Dave Schultz Memorial began at 9:30am (MT) and was broadcast live in the US on FLOWrestling. 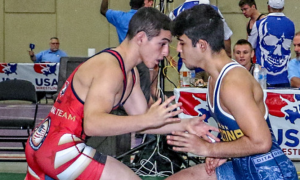 Manville, competing in Greco for the first time this season, cruised to tech fall victories over an up-in-weight Colin Schubert (NYAC/OTS) and Brandon Mueller (Air Force/WCAP). 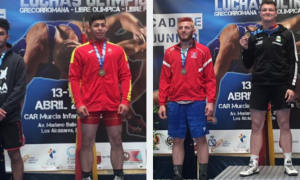 That set him up in a pivotal semifinal opposite two-time U23 World Team member Jesse Porter (NYAC/OTS). Manville used the first passivity of the bout to gut Porter for two, and added another pair of ticks to the scoreboard, eventually prevailing 5-1. His opponent in tonight’s final, fellow 2017 World Team member Patrick Smith (Minnesota Storm), is also enjoying an extremely strong tournament. Smith started off by shutting out Nick Tarpley (NYAC) in the quarterfinals, but that was just the appetizer. 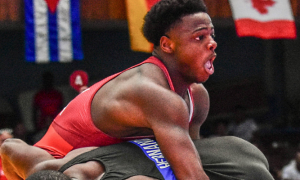 In the semifinal, fans were treated to another running of Smith’s seeming long-running rivalry with ’18 World Teamer RaVaughn Perkins (NYAC, world no. 17). They’ve battled for years now on and off, most famously in the finals of the 2016 Olympic Trials. Perkins emerged from that best-of-three series, though Smith got him back a year later in the ’17 Trials semis. Their most recent match prior to Friday took place in the 2018 US Open final, where Perkins exploded from par terre to roll Smith out in the first period. Things went differently today. A passive chance for Perkins in the first led to a gutwrench and a 3-0 lead. A caution-and-two on Perkins late in the frame gave Smith his initial points, but he’d be adding on in a big way soon enough. Right before the break, Smith clambered into the body; Perkins went to counter, but Smith plowed forward and received four. What had been a 3-0 Perkins advantage had quickly evaporated into a 6-3 Smith lead. In the second period, Smith dialed it up. First was a step-out point. Shortly thereafter, another. And another. And another, which also brought with it another caution on Perkins, thus ending the match, an 11-3 tech win for Smith. Multi-time National Team member Jon Anderson (87 kg, Army/WCAP), back in action for the first time in over 14 months, is now a second-time Dave Schultz Memorial finalist. Although, he almost didn’t make it out of his first-round bout against Kevin Radford (Sunkist). Anderson was down 7-1 in the second when Radford appeared to have scored the match-ending points. But the sequence was called back, they restarted with Radford bothered by an apparent injury, and Anderson rallied to an improbable 13-7 comeback victory. In the semifinal stood Cheney Haight (NYAC), who bumped up to 87 this week after previously declaring his candidacy at 82 kilograms. The scoreboard didn’t light up between the pair in this one. It was a grinding struggle from beginning to end, but one that saw Anderson get the nod after a 1-1 criteria decision. Anderson, a Major in the US Army, last competed at the November 2017 running of the Dave Schultz Memorial, placing third. His opponent tonight will be 2016 Pan Ams champ Alan Vera (NYAC) of Cuba. Vera punched his ticket to the final by defeating Joe Rau (TMWC/Chicago RTC). 2017 Junior World Champion Kamal Bey (Sunkist, world no. 7) is back up at 82 kilos for the first time since last fall. 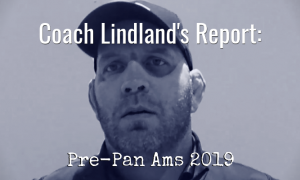 And as could be expected, he’s gunning for his second Dave Schultz gold. Bey rung up tech’s over Spencer Woods (NMU/OTS) and Vlad Dombrovskiy (Army/WCAP) to advance to the final. On the opposite side of the bracket awaits ’18 U23 World Team member Carter Nielsen (Minnesota Storm/OTS). Nielsen has looked sharp in his own right on Friday, taking out John Kent (GWC) and Terrence Zaleski (Marines) via tech. This is the first major Senior final for Nielsen, though he did earn a silver last year at Sweden’s Malar Cupen. 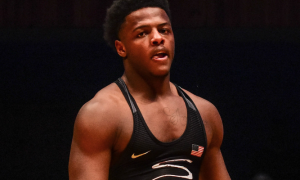 At 97 kilos, it will be a rematch of the 2018 World Team Trials challenge tournament final, as G’Angelo Hancock (Sunkist) and Lucas Sheridan (Army/WCAP) have both done their part today. Hancock performed exceptionally in the morning session, first dominating Canadian Thomas Barreiro before coming away with a fall at the expense of Eric Twohey (Minnesota Storm). Sheridan has spent even less time on the mat thus far. He began his day with a tech over Phillip Barreiro (CAN) and then flattened Khymba Johnson (NYAC/OTS) in the semis. 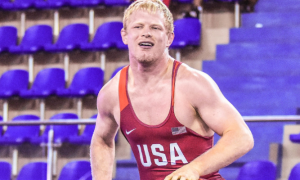 Former Junior World bronze medalist Toby Erickson (130 kg, Army/WCAP) seems to have not missed a beat in his first event following an arm injury. And like Bey, he is in position to hunt down his second Schultz title. In his only match on Friday, Erickson defeated Marine Trent Osnes via tech at 1:13 of the first period and is now slated to meet Georgia’s Gocha Davitadze (GEO) in tonight’s final. The finals and medal matches begin at 7:00pm (MT) and can be viewed live in the US on FLOWrestling.